It is said that “eyes are the mirror of soul”. This face area is primordial for our image, since it reflects our entire mental world. Eyes play a major role among our facial characteristics, since they help us better express our personality and feelings. The eyes’ appearance is heavily affected time and gravity. Specifically, the normal aging phenomenon resuls in the loosening of the eyelid skin, forming of wrinkles, folds and “bags”, on both the upper and lower eyelids. The solution to the problem of permanently tired, loose eyelids, filled with wrinkles does exist and can be solved by a surgical procedure called blepharoplasty. Blepharoplasty is a treatment concerning the upper eyelids, lower eyelids or both at the same surgical time. Often combined with other refreshing facial surgical techniques such as Face or Neck lifting. Which are the specific anatomical features of the eye area and what changes occur as time goes by? “Crow’s feet» area, i.e. lateral fate of the eye. In order to attain an aesthetically beautiful eye, the eyebrow position should be on the one hand (for men) at the height of the upper pole of the eye socket, while on the other hand (for women) this position should be above the eye socket or right at its upper limit. This eyebrow position is totally natural and harmonious, which unfortunately disappears with age. Specifically, both the age with the continuous effect of gravity it entails and the genetic predisposition are to blame for the forehead loosening and the eyebrows fall, as well as for the loosening and changes in the quality of the tissues and of the upper and lower eyelid skin. What are the changes in the eyebrows and the forehead that time triggers? When we see a person with very deep wrinkles on the forehead or with thick and loose skin “scarred” by time, we must bear in mind that this image is not a random phenomenon. The more those tissues and soft facial molecules are loose and the forehead is heavy, the effect of time and gravity becomes more intense, since the eyebrows fall and further descend compared to the eye socket. The lower eyebrows’ position prevents the straightforward vision which causes reduction of vision and subconsciously forces a person to use their forehead muscles so as to raise the eyebrows and see better. This results in creating or even deteriorating deep horizontal forehead wrinkles. As years go by, the forehead is getting “heavier”, the tissues loosen and the eyebrows fall. Consequently, only the surgical restoration of eyebrows in the anatomically right position could result in improving the forehead wrinkles (this procedure is called Forehead Lifting or Eyebrows -Forehead Lifting or Eyebrow Lifting). What are the changes in the eyelid area caused by the time? adipose tissue located in two positions, (a localization position is centrally in the middle third of the second and the inner portion of the upper eyelid). Because of the passage of time, skin is getting looser and excessive in the upper eyelid area accumulating fat in the middle and inner eye compartment. To some people, the muscle raising the eyelid becomes loose, leading to limited vision. In the first two cases, this phenomenon is called “dermatochalasis” and it can be corrected with blepharoplasty while the latter is called “eyelid ptosis” and can be corrected with a surgery called “eyelid ptosis correction”. What are the alterations caused by the passage of time in the lower eyelid area? three adipose tissue compartments located in the inner, middle and outer third lower eyelid area. As time goes by, skin on the lower eyelid area is getting thinner and looser with many fine or deeper horizontal or oblique wrinkles and folds. Eyes look swollen, a common phenomenon usually exacerbating in the morning and are characterized by the formation of swelling in the lower eyelid area, known as “eye bags”. Those “bags” are in fact fat accumulation in the three lower eyelid area compartments and not due to water swelling, as it is commonly believed. At the bottom of the lower eyelid area, i.e. the precise point from the eyelid skin onto the cheek skin, a slot is formed over the years, scarring the skin and giving a feeling of hollowness. Usually, this hollow coexists in the lower eyelid area with the “eye bags” mentioned above and require a special treatment during the surgical procedure. What are the alterations caused by time to the outer corner of the eye, i.e. “crow’s feet”? The outer corner of the eye, i.e. the area of the outer canthus also known as “crow’s feet” consists of a thin and elastic skin from a circular, strong muscle, responsible for the eye closure. Over the years the skin fibroblasts degenerate, a thing that makes skin thinner with radially placed wrinkles and folds in the outer canthus area, looking like a “crow’s feet”. The solution for reducing or even eliminating these wrinkles is ƁOƬOX, which causes a chemical denervation and deactivates the muscle. The result is a smooth and clean skin free of any annoying wrinkles and folds which scar skin and make it look aged. Over the years eyes look tired wrinkled and loose. Is there any solution for that? What happens to the eyelid area as we grow up and how can it be solved? First of all, in order to solve a problem, we should recognize the cause of it. When we look at a person with “tired” eyes, we must understand if this is only because of the surplus skin, which is looser and accumulates in the upper or lower part of the eyelashes or if it is something more complex and concerns other tissues, as well. Muscle loosening that raises the upper eyelid area (eyelid levator) unable to lift the eyelid, a fact that makes the eyes look smaller the vision is getting limited. The greater the age, the greater the likelihood is that the problem be a combination of all the above mentioned three conditions. Therefore, the surgical estimation plays a significant role when it comes to choosing a treatment. What is the upper blepharoplasty? If eyes look tired combined with wrinkles and folds, then the problem is just a slight excess skin on the upper eyelid area and it is called dermatochalasis. The most adequate surgical procedure is the removal of the excess skin. The surgical incision is carefully designed so that the suture line is located along the eyelid groove (which is the normal skin fold between the eyebrow and eyelash) so that the incision lies completely within this groove and is almost invisible. If the excess skin coexists with excess fat, this excess is more often than not localized in the upper-middle and upper-inner thirds of the eye area and can be surgically removed along with the strip of excess skin. Specifically, if we close one eye and push the eyeball with a finger, if there is excess fat, it shows inside and in the middle above the bulb with each pressure, given that those positions are anatomical parts of fat localization. The same thing happens at the lower eyelid area as well. 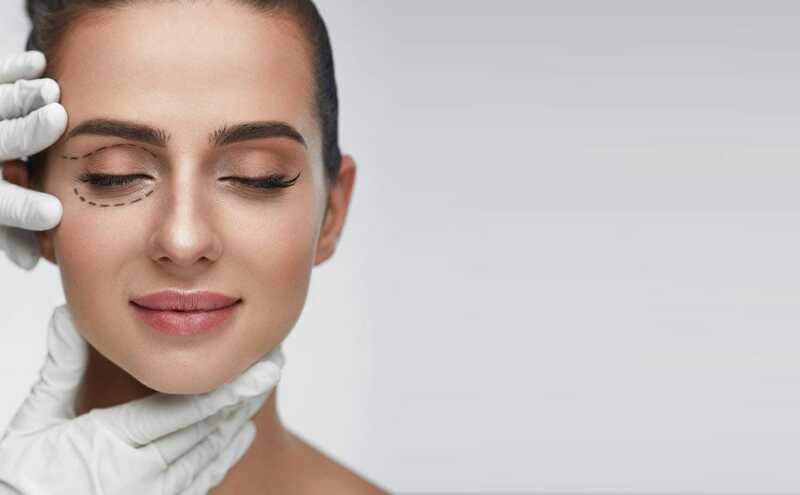 By removing the right amount of fat and the exact excess skin thickness from the surface of the upper eyelid area, we can achieve a safe, harmonious and balanced result. That’s the blepharoplasty of the upper eyelid area. What is the lower blepharoplasty? If the problem is the appearance of many thin horizontal wrinkles and folds in the lower eyelid area and if eyes look swollen -an image that often deteriorates in the morning, then the solution is lower blepharoplasty. This type of surgery is aimed at correcting skin loosening, which is to blame for the creation of wrinkles and removal of excess fat stored as bulges on the lower eyelid area and is known as “eye bags”. The “eye bags” in the lower eyelid area are not caused because of water swelling. This is fat, accumulated locally into three compartments of the lower eyelid area (i.e. the lower limit of the eye corner). One of those compartments is located centrally, one near the inner and one near the outer canthus. This problem is more obvious in the morning due to the concentration of fluids on the eyelids where the tissues are relaxed. The surgery is performed through a very thin, horizontal incision, parallel to the lower eyelid lashes, which is designed within approximately 2 mm from the lashes. Through this incision, we remove the exact amount of excess fat that is the cause of “eye bags” in the lower eyelid area. Sometimes instead of removing the excess fat, we may need to re-distribute the adipose tissue, in order to smoothen the lower limit of the eye socket. After the removal or re-distribution of excess fat, we proceed with the excision of the excess skin and the correction of the loosening of the lower eyelid area. What is the eyelid ptosis surgery? The greater a patient’s age, the greater the probability of skin loosening and the excess fat in the upper eyelid area appeared in the mechanism which controls the opening of the eyes. Namely, the opening of the eyes is performed by lifting the upper eyelid through a muscle called the levator muscle of the upper eyelid. Normally, when the eye is open, the upper eyelid should cover only about 2mm in the upper limit of the iris. When for any reason the upper eyelid is lower and covers the iris more than 2mm then the phenomenon is called eyelid ptosis. The eyelid ptosis makes the eyes look smaller and the vision deteriorate. The eyelid ptosis treatment is etiological. For older ages, the cause is usually the levator muscle relaxation and its treatment should be strengthening the muscle through shortening and redefining its position. The eyelid ptosis may coexist with dermatochalasis, but it is a special disease that requires careful diagnostic evaluation and specialized surgical approach. It belongs to Reconstructive Plastic Surgery and it should not be associated with dermatochalasis, which is part of the Aesthetic Surgery. Is anesthesia required during the blepharoplasty? Is local anesthesia adequate? Yes. The surgery can be performed under local anesthesia and it is often the case in the blepharoplasty of upper eyelid area. Since the aim of Aesthetic Plastic Surgery is to attain the best possible results with greater safety and less discomfort for the patient, it is worth mentioning that the proposed anesthesia method in blepharoplasty is local anesthesia combined with sedation (neuroleptanalgesia) or the combination with local anesthesia. By these combinations of anesthesia, the patient feels relaxed and sober, not anxious and without any pain, so the operation is absolutely safe, controlled and painless. How is the blepharoplasty performed? The surgery starts after anesthesia of the area has been applied, so as to be completely painless. A local anesthesia or a local anesthesia combined with neuroleptanalgesia (“sedation”) or general anesthesia to the upper or lower eyelid area is performed where there is skin loosening and excess fat. As for the upper eyelid, after a very careful planning, the excess skin and fat are removed and the incision is sutured meticulously by absorbable suture, which helps avoiding any sutures’ removal from the upper eyelid. The incision is perfectly camouflaged within the eye corner groove and is almost invisible. When it comes to the lower eyelid area there are two different blepharoplasty techniques. The first technique is called Traditional blepharoplasty and the surgery is performed through a very thin, horizontal cross-section, parallel to the lashes of the lower eyelid, which is planned within approximately 2 mm from the eyelashes. Through this incision, we remove the exact amount of fat and excess skin which provoked the «eye bags” in the lower eyelid area. After the fat removal is completed, we proceed with the excision of the excess skin and the correction of loosening of the lower eyelid area. The second blepharoplasty technique of the lower eyelid area is called Transconjuctival blepharoplasty. The incision is done in the inner part of the eyelid, into the conjunctiva and is usually performed in younger people with a slight skin loosening and soft “eye bags”. Does the blepharoplasty hurt? How will I look like after the surgery? Although the periocular area is very sensitive, it is impressive that the blepharoplasty does not hurt even during the immediate postoperative period. The only thing one feels is a feeling of pressure or mild discomfort, since the area forms an immediate postoperative edema. The usual postoperative image presents swelling and bruises in the eyelid area, the cheekbone and the cheeks. The swelling and bruises are more intense in the first two or three days and at the end of the week the violet color around the eyes slowly disappears and is replaced by a pale-yellow color (due to absorption of microhematomas) and “swelling” is transferred lower towards the chin (because of the gravity effect). The patient may go outside under some restrictions after 3-4 days, wearing dark glasses and after 10-12 days more freely, since the surgical incisions can be easily covered with makeup. Sometimes after surgery the vision may be blurred, which may be accompanied by tearing or mild light sensitivity. These symptoms recede within a few days. If a patient suffers from dry eyes before surgery, he/she should be checked by an ophthalmologist because the surgery may aggravate it. Right after surgery, the patient can leave the clinic and go home under some instructions. The patient should remain layed down for about 24 hours, having inserted 2-3 pillows under his head so that the head is in a higher level than the rest of the body to avoid any edema. In order to reduce the swelling, we should apply frozen compresses to the eyes infused with cold chamomile, which helps avoiding swelling. The switch of cold compresses should begin immediately post surgically and be continued for at least 10-12 hours afterwards. What should I avoid post surgically? For the first two to three days after surgery, we should take care of the incisions, keeping them clean and sterile. This can be achieved with the alternation of eye creams and eye drops which can prevent infections. Immediately after surgery and for the next 12-14 days the patient should avoid bending and any strenuous activity (including activities that increase blood pressure, such as weight lifting or sports) in order to prevent the formation of hematomas etc. Patients using eye contact lenses should avoid wearing them until the eye area is totally restored (i.e. after about 3-4 weeks). Also, they can watch TV or read after two or three days and can go to work after a week to ten days after surgery. Regarding the sutures removal (except for the absorbable ones that do not need to be removed because they fall on their own), they are usually removed on the 3rd or 4th day. Are there any side effects after the blepharoplasty? The blepharoplasty is a routine procedure of Plastic Surgery and is among the treatments, which can succeed in regenerating the facial features. However, it requires experience, good knowledge of anatomy and surgical techniques by the surgeon, as well as the ability to recognize the special characteristics of each person, in order to attain a perfect aesthetic and functional result. Because of the very sensitive nature of the tissues in the periorbital region, the most frequent concequence after blepharoplasty is contusions (bruises) and edema (swelling), which both gradually disappear within 5-7 days. Also chemosis is a small self-limited swelling of the conjunctiva which normally recedes within 10 to 12 days. Photophobia, tearing or limitation in tear production may appear for a short period of time after the surgery. They can be treated with artificial tears and avoiding of bright light exposure. The upper eyelid lagofthalmos and the lower eyelid ectropion are both two rare complications of blepharoplasty closely related to the upper and lower eyelid position. If lagofthalmos or ectropion slightly appear, then they can be corrected with massage; yet if they are more intense, one may need surgical correction. Hematoma, inflammation or any infection of this area are also rare complications, which are treated with drainage and antibiotic care respectively. When it comes to the periocular region, the blepharoplasty can also correct wrinkles in the “crow’s feet” or small wrinkles under the lower eyelid? The “crow’s feet” wrinkles or micro wrinkles under the lower eyelid area are due to the contraction of the circular muscle called muscle orbicularis, whose purpose is the closure of the eyelids. Over the years, skin around the eyes becomes thinner, so any movement of the cycloid muscle is outlined much more strongly to the skin and multiplies any wrinkles in the “crow’s feet” or in the lower eyelid area. Because of the importance of the circular eye muscle for the closure of the eyelids, during the blepharoplasty we should try not to injure the muscle and keep its functioning as intact as possible. Simply put, we can achieve only a slight amelioration on the “crow’s feet” wrinkles and to those under the eyelids with blepharoplasty. The solution to the problem of wrinkles formed periocularly is the chemical denervation of the circular muscle with ƁOƬOX (Botulinum toxin). Regarding the periocular region, can the deep horizontal forehead wrinkles be corrected surgically or ƁOƬOX is required? Botulinum toxin can improve to a great extent very deep forehead wrinkles. However, it requires special attention because the inactivation of the frontal muscles can add up to the loosening in the eyebrow area and accelerate their fall. The real solution to low eyebrow position and to very deep horizontal wrinkles is the surgical recovery of the forehead, i.e. the surgical suspension of the eyebrows at a new, higher level in the eye socket. This procedure is called Forehead Lifting or Eyebrows Lifting. This hollow often appears under the “eye bags” in the lower eyelids and creates an incision in the skin between the lower eyelid and the cheek (tear trough) due to atrophy of the adipose tissue. This tissue deficit cannot be corrected with the blepharoplasty, unless the fat of the “eye bags” is redistributed. The solution for the correction of this unsightly hollow is to cover the tissue deficit either with fat transplantation or even more easily with the local application of injectable implant, such as hyaluronic acid, to the deficit area. This is a routine application technique with impressive results. How long do the blepharoplasty results? The effects of a successful blepharoplasty last about 12 to 15 years. In fact, this surgery has excellent duration over the years because even after this period the re-operation is technically easier and shorter in time, since we have to remove only a slight excess of skin and fat which has been accumulated over the years.